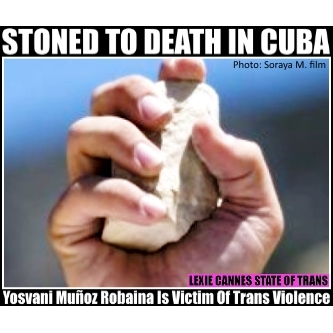 LEXIE CANNES STATE OF TRANS — A blog run by a Cuban dissident reports that trans woman Yosvani Muñoz Robaina was stoned to death in a public park in Pinar del Rio, Cuba on April 26, 2015. A number of other Spanish-language media reports seem to confirm the death, however, I’m unable to tell if it’s a second confirmation or if each one sources the same blog. The blogger, Yoani Sánchez, reports Robaina was taken to a hospital after the stoning and later died from her injuries. An autopsy has been performed and three men, an adult and two minors have been detained, apparently, by the police according to the victim’s mother. There are no further details, nor names of the detainees are available. In Pakistan, trans woman Almaroof Bijli was found dead on May 5, 2015 by a Gungal bus stop. Although her body was found burned and mutilated, police have yet to declare the death a murder. A few days later, three trans women were killed when two motorcyclists fired into an area where trans people frequent in Rawalpindi. The victims were identified as Saima Shahzadi, Shah Zaib and Billi. Two others survived the attack. There are no suspects at this writing. Anyone with additional information or photos, please post in the comments section below. ‹ Miley Cyrus; Not a book to judge by its cover! Cuba? They have a rep as a trans-friendly nation, to some extent, at least. That the perpetrators in Cuba were immediately taken into custody stands in stark contrast to the incidents in Pakistan. But all were examples of male rage and privilege. I suspect religion gave them the immorality required to commit such a heinous crime.